Jackie Korth, a Wisconsin native, grew up open-minded and always ready for an adventure. At the age of 17, Jackie's cousin, also named Jackie died in a horrific tragedy. The loss of her cousin who was the same age and who had been like a sister, pushed her towards a path of desiring to know if her lost loved one was ok. Two additional losses of her uncle and father prompted signs from beyond that there was life after death and that indeed her lost loved ones were trying to communicate with her. No longer able to ignore the signals from beyond Jackie began studying mediumship with well known mediums across North America and the UK. Today Jackie is proud to call herself a Psychic Medium. Through the development of her innate gifts she has been able to effectively communicate hundreds of messages to thousands of people across the US. 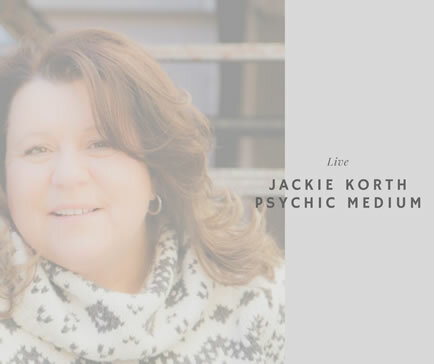 Jackie appears in front of large audience, holds private groups, and does one-on-one readings. She also has an intuitive development course and mentoring program for those desiring to discover their own gifts. Jackie feels it is an honor and privilege to bring messages from loved ones who have crossed into the spiritual world. Her events bring warmth, humor, and a sense of peace. Audience members often share "they walk away feeling as though they have experienced something they will never forget." Jackie is a co-founder of Random Acts of Kindness in the Fox cities and holds speaking and teaching engagements where she addresses how to deal with and heal from loss. I had the most incredible experience attending one of Jackie Korth's group readings. It was amazing listening to other participants as they received information about loved ones who have passed. I was more than amazed when she began speaking of my family members. Her reading was very accurate and contained information that only my family would know. Due to a sensitive situation concerning a loved one who has passed, Jackie offered to delve deeper into that situation for our family so that we may have a sense of closure. Jackie truly cares. You will also find her to be extremely articulate, intelligent and witty. She has a beautiful gift to share and I feel incredibly lucky to be on the receiving end of her gift. "Jackie is a rock star. After my reading with her I walked away feeling comforted and filled with awe, wondering how she was able to offer such accuracy, so consistently. It was a heart-touching, emotional, intimate experience! Jackie is extremely thorough, yet her sense of humor and outpouring of love is what makes time spent with her so awesome. Magical doesn't even begin to describe her skills. I consider Jackie to be a master of her craft. She is professional, warm hearted and generous which combines to create everything you want in a spirit-filled reading. Because of these qualities, I believe that all who come to know her, will love her"
"Jackie Korth is an incredible medium! I had only had a reading done one other time before I met with her and she blew my mind. I had loved ones come through and the description that she described about each of them was spot on and she was able to deliver the message so clearly to me. The reading that I did with Jackie changed my life. My loved ones had a message to give me and I was able to hear it through Jackie. My grandfathers and my husband's great uncle all relayed the same message about where our lives should be heading. My husband and I decided to listen to our past loved ones and allow the universe to present opportunities to us. We decided to follow what was being presented and moved across the country. If I hadn't been open minded to work with Jackie, I'm not sure that I would have been so trusting to allow the universe to show my family what we needed to do. I'm forever grateful to her and her abilities to successfully and accurately communicate with my loved ones. Thank you Jackie!" I am not sure how to word it except that it was amazing. I went without any specific expectations but was blown away by those that presented themselves. Jackie Korth is an amazing medium. I had the best experience with her. All my questions were answered and I never asked one. She knew things that just astounded me. I had quite a few people come through with messages. My Mom and Dad most importantly. Everything that was weighting me down, all become clear and I felt 50 pounds lighter. I would highly recommend Jackie to help guide you through your life journey. Truly an amazing talent. Be prepared to be walking on clouds after your reading with Jackie. Well that's how I felt! Jackie does an awesome job and is spot-on with the messages she delivers. Jackie made my experience fun and filled with love and laughter. How comforting it is to know that my mom and dad are back together after being separated for 30+ yrs. She helped me identify and look for signs from my loved ones in spirit. Jackie has made me a firm believer that there definitely is more to come after we pass. She is one word...AMAZING! Jackie is an astonishing medium! We met at a John Holland's class, so in one of the practices she easily communicated me with my little son who just left 4 months ago. Nobody in the class (except for John) had seen me before. Jackie described him physically, gave me detailed messages, but the most amazing one was about my wife who was 2,600 miles south. My son told her he was with my wife at that moment in a specific and very detailed room looking at some trophies (actually it was my wife's first time there). Later that day, I called my wife and she confirmed all the information. At the time Jackie was communicating with me, my wife mentioned to someone that my son would be so happy looking at the trophies. So actually, he was right there with her as well as with me at the same time. And Jackie did that for us. Since then, she had done a couple more readings with beautiful information from my son. Thank you, Jackie!! My reading turned a little light inside me and help me find my way. I felt so much better after my session with Jackie. When we connected to my loved ones in spirit I was so comforted in knowing I am never alone. I have also been to several of Jackie's events and I feel such peace and love that even if I don't receive a reading that night I feel a part of something bigger. I have had sessions with Jackie over the last several years. Her ability to connect me with my loved ones has provided such comfort. The peace I feel knowing my loved ones still are around just in a different way. Jackie is not about herself she is truly about bringing healing and peace to the communities she visits. Jackie had brought through my daughter Taylor with the most accurate information that no one else would know. Jackie made me feel more comfortable knowing my daughter is doing amazing and still with us everyday it's just in a different way. Jackie your incredible! Jackie is awesome, I am so glad we got her. The guests loved her and only had good things to say about her show. They want us to bring her back! So hopefully next year we can do it again. The emotional comfort Jackie provided to our father in the last months of his life is difficult to put into words. Her ability to communicate with those who have passed and share their messages with Dad was amazing. The compassion she had interacting with Dad was wonderful. He was comforted knowing his wife and brothers were present in the room with him. This gave Dad such peace and tranquility it helped him pass over. We are very grateful for Jackie's insight and the peace and comfort she gave us also.